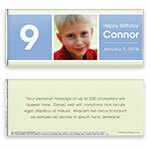 Celebrate your special birthday boy with this classic, simple candy wrapper design. Design: Bold birthday number with a photo and coloured background. Personalization: Number, message and photo on the front, message on the back.